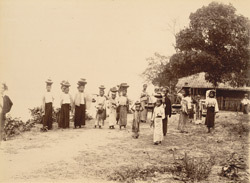 Photograph of Burmese women carrying water, taken by Watts and Skeen in the 1890s, from the Curzon Collection. This view shows a group of women and girls posed with water pots on their heads beside a river. They wear the traditional Burmese dress of a wrap-around skirt known as a hta-mein. The independence and social freedom possessed by Burmese women was remarked on by many European visitors during the colonial period.